This is the first in a series of lighted porcelain scultures from the mythical town of Mayberry, inspired by the "Andy Griffith Show" on television. Produced in 1993 by Hawthorne, the Mayberry Courthouse" is a faithful reproduction of the building where Andy and Barney occupy the Sheriff's Office, along with Otis the town drunk. 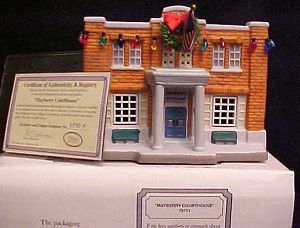 The Mayberry Courthouse is in mint condition, and is packed in it's original box. It comes with light fixture and cord, plus an American flag, a wreath, and a garland of Christmas lights to decorate the Courthouse for the holidays. The sculture also comes with a Certificate of Authenticity" bearing the number "6230 A". Website design and hosting by Sohodojo Business Services. Item 246 of 466 items displayed in viewer. 0 items in cart.